This applies to live and online poker. The best time to decide to bluff is late in a game, when you’ve watched the majority of players check, fold or lightly bet the pot. That indicates that there might not be much out there in terms of strong poker hands, so you could get people on their heels if you starting throwing chips around like you’ve got something. Sparsely-bet, small pots are the ones that can be stolen by bluffing, so don’t expect to fib your way to a massive jackpot. Have you been bluffing a lot and have you been caught with your pants down already in this game? Two questions you should ask yourself before pulling the trigger on a bluff. Players who have bluffed numerous times already in a game will eventually get caught – like bank robbers not knowing when to quit. Perhaps this is your time. And players who have been called out when bluffing have that reputation now and have lost the element of surprise. If you’ve been nailed once already on a bluff, the others players may see this move coming a mile away. In order to bluff, you’ve got to scare away the other players. It’s tough to do that when you’re down on chips and going against players with a surplus of winnings. Those are the kinds of guys who can afford to see your cards just for giggles – win or lose. Bluffing should really only be considered when you can put your money where your mouth is. You want to bet aggressively to give the illusion that you have a winning hand and make other people – who may not have the strongest hands – pay a premium to see your cards. 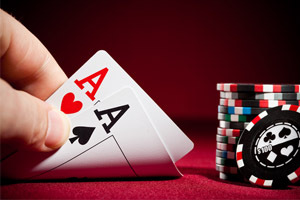 Having a lofty chip stack is like having an intimidating weapons arsenal and your opponents must make a decision on whether it’s worth going to war over.